Rally in America: Should We Even be Surprised? I was watching the most recent Launch Control video, and it got me thinking. There’s a TL;DR at the end, for those of you who are too impatient to read the whole thing. 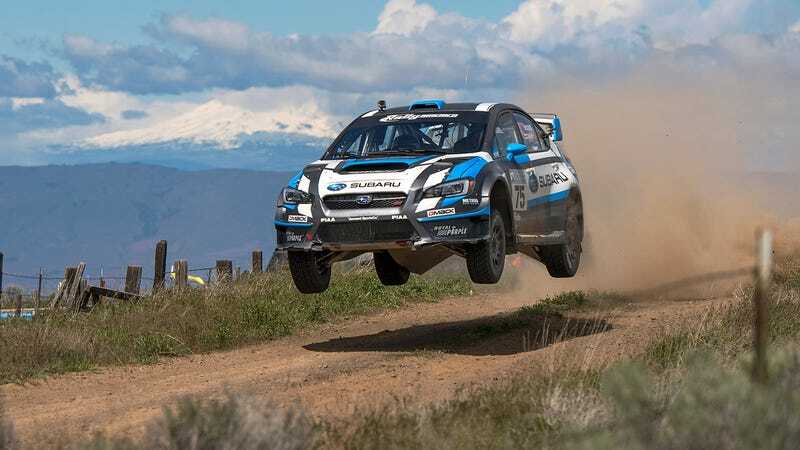 Should we even be surprised that Subaru Rally Team USA’s David Higgins and Craig Drew are dominating the competition? They have won every Rally America National Championship since 2011 and are on track for a five-peat. Of the past thirty-two Rally America events, they have won twenty, and podium’d for ten. Only in two rallies did they not reach the podium, and both were DNFs caused by mechanical issues. What is the source of this complete dominance and control over the Rally America circuit? In my opinion, the answer is simple: Money. Lots and lots of money. According to Travis Okulski/Jalopnik/Subaru, the value of the above car, SRT’s 2014 Subaru WRX STI car, is in excess of $250,000. That is a not-insignificant sum of moola. To put that in perspective, that is within $9,000 of the Ferrari 488 GTB’s starting price. This Subaru hatchback costs as much as the latest Ferrari, and that does not even include the development costs, which could easily double or even triple the cost of the overall car. Compare this to competitor’s cars, which are not nearly as expensive, and therefore are not nearly as competitive. If it is not yet obvious, Subaru Rally Team has an advantage. Having the support of a manufacturer includes benefits beyond the wildest dreams of the lowly privateer team. The testing and research opportunities, hospitality suite, hotel reservations, and service crew are all handled by the big dogs at Subaru. Looking at past overall championship standings probably tells the story better than I could. As you can see, the closest competition and the narrowest victory was in 2011, David Higgins’ first year of competing in Rally America. The next narrowest victory was in 2013, when Ken Block was toe-to-toe with Higgins all year, only to slip up at the final rally of the season. The interesting thing is that the runner up, apart from the 2014 season, was in a well-funded car that was close to or on par with SRT. See Ken Block’s Ford Fiesta or Antoine L’Estage’s Mitsubishi Evo from this very limited study. This might only be an issue for me, because I like to cheer for the underdog. Whenever I watch Launch Control or read the results of a rally, I automatically expect the winner to be Subaru. I feel like it is similar to last year’s F1 season, in which Mercedes destroyed the competition in almost every race. TL;DR: This is not a problem, just a fact I thought I would share with you lovely people. It would be nice, however, if more manufacturers took an interest in rallying, and funded more teams at a level to compete with the currently-dominant Subaru Rally Team USA. Unfortunately there isn’t enough media coverage and money in American rallying. Therefore, if that can’t happen, which I assume is the case... well... never mind then.